This level has medium difficulty. 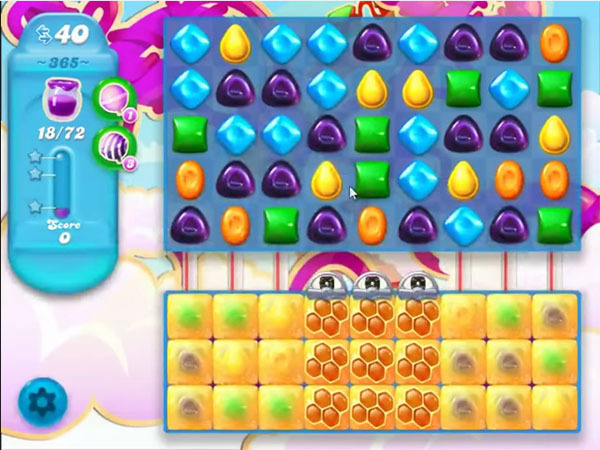 For this level try to combine purple candies from top part of the board to get four special candies to break the blockers and spread the Jam. Or play near to Jam to spread it to near candies. Medium difficulty,ha haaaaa.Not even one single jelly. I don’t know why you call them ‘walkthrough videos’. You need to slow down and explain why the play is made. I have covered the bottom in jam, with no jam in the top part. Impossible, frustrating, and confusing level. Don’t understand at all!! You have to ‘spread ‘ the jam, so use a fish, stripe, wrapper, bomb etc whilst inside the jam that you have uncovered from the bottom, to the top half. Only problem is its bloody hard lol my highest is 70 jam and still cant do it! Can I just skip this level? I’ve been doing it for a while and I’m about to lose interest in this game. This level ridiculous!!! 40 moves? Did they take away 2? Cuz mine starts with 38, hard level I don’t get it, stupid licorice get in the way. You’re playing against a computer with infinite computational skills in a for-profit game. You will “win” when the app LETS you! That’s why these ‘walk through’ blogs are a useless joke. These apps are a sick-programmers dream! They get hard knowing they’ve created a game that allows them to finally feel superior to others. My advice – never EVER spend a GD dime on these asinine apps and teach the programmers a lesson especially when they intentionally program levels to be so impossible. Again, YOU WILL BEAT A LEVEL WHEN THEY LET YOU AND NO SOONER! A v. Hard level. I think that they want me to spend money to get though it. Anyway what happened to sprinkle shell? Ok, I really hate this level. I can get the jam on the top part of the screen, but not on the bottom part. Seems like I’ve been playing this level forever, and I just can’t seem to get it. I wish you would make this a little easier to do. I’m about to delete this game. Medium difficulty…..hahahaa. NOT. This level is very hard, it takes all the moves to get jam at the bottom with none at the top, only once have I had any jam at the top as well, also how do you get the gift boxes, I have never had a gift box with free hours in all 365 levels, this game is full of gliches I think I will have to pack it in. This is the game that is going to make me quite playing. This is impossible, I WILL not buy. This is the most aggravating level I’ve played. I’ve had them all but one before. I’m about to give up. Enjoyed the game while it lasted. Never get the jam up to the top level. How???? getting frustrated, ready to quit this. No fun at all. Still noone has post how to get it started on lower level!! Alot of complaints but no help..Did everyone give up on this level??? ok I figured it out..In order to spread jelly on bottom you have to get something o the top that can get the jelly started below. once it gets started it went quickly because of the purple.. So as quickly as u can use a special candy that has to go below to spread… the fish works even….